Aromas potentes a fruta perfectamente madura como grosellas y arándanos combinados con aromas de roble muy fino y para nada dominante. Toques balsámicos típicos del terruño de Vega Sicilia. Viñedos plantados a una altura de unos 700 metros sobre el nivel del mar. La bodega tiene 210 hectáreas en total, de las cuales solamente algunas se utilizan para la elaboración de Valbuena. Arcillo-calcáreo, con zonales pardos y una parte aluvial. Continental con un invierno suave con temperaturas ligeramente superiores a la media y lluvias también inferiores a la media. Las lluvias y las temperaturas relativamente bajas de la primavera provocaron un retraso en el ciclo. Temperaturas normales en verano, con algunas tormentas sin daños reseñables. El mes de septiembre discurrió con temperaturas diurnas habituales pero con mínimas inferiores, con lo que hubo una gran amplitud térmica. Manual en cajas de 12 kilogramos. Tuvo lugar desde finales de septiembre hasta mediados de octubre con abundantes lluvias. Permaneció durante aproximadamente 5 meses en depósitos de madera de 20.000 litros de capacidad. Posteriormente permaneció durante unos 16 meses en barricas nuevas (50% roble americano y 50% roble francés), 4 meses en barrica envinada y finalmente 4 meses aproximadamente en grandes tinos de madera antes de su embotellado. Tuvo lugar en junio de 2015. This wine was re-tasted prior to this report with similar descriptors to my previous tasting for a report I published earlier this year and the score was the same. 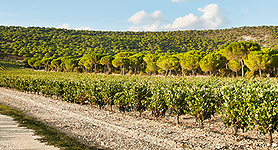 Cropped from an unusually cold and rainy vintage in which they will not bottle Único, the 2013 Valbuena is always released in its fifth year. It's mostly Tempranillo with 5% Merlot that was put through a three- to four-day cold soak in the oak vats, where it fermented with indigenous yeasts and was pumped over. It matured in new and used 225-liter French and American oak barriques and also in 20,000-liter oak vats, where the larger vessels respect the fruit, especially in a more fragile vintage like 2013. 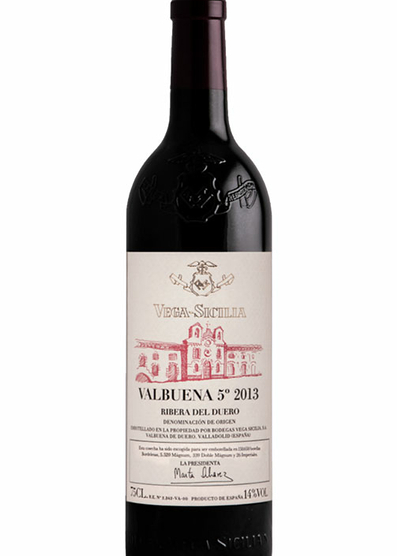 It's a very elegant and fresh Valbuena with a developed nose, quite classical with a fine texture, elegant tannins and a supple, long finish where the oak is still quite obvious. I liked it very much and consider it a triumph over the challenges of the year. 150,650 bottles and some larger formats were produced. It was bottled in June 2015. Technical Director Gonzalo Iturriaga de Juan arrived in 2015 in time to blend this wine. He calls it a ‘viticultor vintage’ - a grower's vintage, as it was a wet year with botrytis that needed plenty of selection. For the first year the wine was aged in French and American barriques, which at that stage was ‘angular’, noted Iturriaga. However, following ageing in 20,000-litre vats, the wine acquired its current elegance. It's very aromatic, with dark fruits and a lively, fresh acidity with notes of rosemary and wild herbs.